There are very few sequels that stay on par with or surpass what the original film had achieved. Election 2 "Harmony Is a Virtue" not only accomplished that difficult feat, it even enhance the characters and events that had transpired from the original movie, making it an even better one. It has been said that the original length of Election was meant to be a 3 hours version but had to be cut down to 1 hour and 30 mins which was more feasible for runtime in cinema. And now with the sequel, watching both movies back to back actually present a more complete story that Director Johnny To wanted to tell. While you don't have to watch the first movie in order to understand what going on in this sequel, viewers watching it in the right sequence order will appreciate the character setup and events that were set up in the first one and the fruition that it bears in this second one. In the sequel, time is almost up for Lok (Simon Yam)'s occupation as the Wo Sing triad chairman but he is not willing to give up his position just yet. His former aides Kun (Lam Ka Tung) and Jet (Nicky Cheung),who helped him get his chairman position are now vying for his position. But none of his aides have more potential than Jimmy Lee (Louis Koo) who was initially unwilling but eventually realized that in order to expand his legitimate business in mainland China, he has to be the head of the society. In a way, Jimmy's character runs parallel to the likes of Michael Corleone in The Godfather trilogy; no matter how hard they struggle to get out, circumstances will always pull them back in. This set up the well crafted power struggle between these few former allies and turnning them into backstabbing foes. Lok is unwilling to relinquish his power and now plays a cloak and dagger game with Jimmy, using those people such as Kun and Jet as pawns. It became of a game of wits and manipulation, pushing the limits to what one is willing to do for more power and wealth. Election 2 could possibly be the best film that Hong Kong have to offer in 2006 and definitely one of the richest characterization and storytelling of the Hong Kong underworld in recent years. 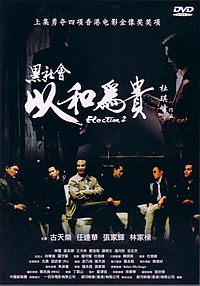 Similar to the first movie, Election 2 is filmed with heavy usage of dark shadow to flush out the darker nature of human greed, meshing with a symphony of wanton violence to produce a solemn piece that bears the uniquely Hong Kong flavour that shouldn't be missed. The trailer is presented in its original Cantonese and Chinese Soundtracks. Besides the Trailer, this DVD also comes with a "Making off" feature that is in Cantonese Soundtrack and has Chinese Subtitles. This relative short "making of" feature (6 mins and 54sec) contains interviews with the Director Johnnie To, the Writer Yau Nai Hoi and the Lead Actor Louis Koo. The trio shared with the viewers their perspective on Hong Kong secret society and how it's changing with times. It was one of the shortest "making off" that I ever saw and yet it was bursting with information and heartfelt comments of the current society by the trio. This film is presented in full screen format and comes with switchable English and Chinese subtitles that's removable. The audio is presented in Mandrain Dolby Digital 2.0.